He who bore our griefs,understands our sorrows – I Am Not Ashamed Of The Gospel Of Christ! When we suffer the loss of a loved one we may feel alone or that others may not understand the deep seated pain of a heart filled with sorrow.It is at this time when some may become bitter as to why God has allowed this loss in the first place.It doesn’t matter if the loss is a child or of one who is older for sorrow is sorrow and it hurts just the same!Someone we have loved is no longer with us.Scripture teaches death is inevitable for each of us,but the difference is God has shown us the suffering His son went through so that although we have a heart filled with sorrow our Lord understands the pain and conflict of our soul.He has bourne our griefs,and carried our sorrows,and in faith we will have eternal life and never suffer loss again by believing in what He has done for us at the cross (Isaiah 53:3-12). 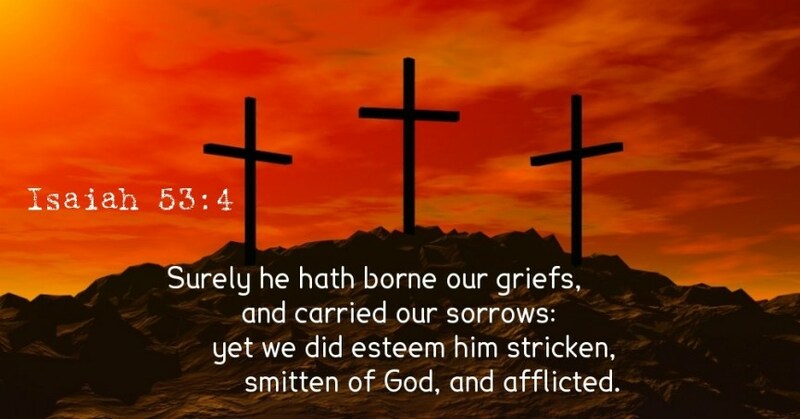 3 He is despised and rejected of men; a man of sorrows, and acquainted with grief: and we hid as it were our faces from him; he was despised, and we esteemed him not.4 Surely he hath borne our griefs, and carried our sorrows: yet we did esteem him stricken, smitten of God, and afflicted.5 But he was wounded for our transgressions, he was bruised for our iniquities: the chastisement of our peace was upon him; and with his stripes we are healed.6 All we like sheep have gone astray; we have turned every one to his own way; and the Lord hath laid on him the iniquity of us all.7 He was oppressed, and he was afflicted, yet he opened not his mouth: he is brought as a lamb to the slaughter, and as a sheep before her shearers is dumb, so he openeth not his mouth.8 He was taken from prison and from judgment: and who shall declare his generation? for he was cut off out of the land of the living: for the transgression of my people was he stricken.9 And he made his grave with the wicked, and with the rich in his death; because he had done no violence, neither was any deceit in his mouth.10 Yet it pleased the Lord to bruise him; he hath put him to grief: when thou shalt make his soul an offering for sin, he shall see his seed, he shall prolong his days, and the pleasure of the Lord shall prosper in his hand.11 He shall see of the travail of his soul, and shall be satisfied: by his knowledge shall my righteous servant justify many; for he shall bear their iniquities.12 Therefore will I divide him a portion with the great, and he shall divide the spoil with the strong; because he hath poured out his soul unto death: and he was numbered with the transgressors; and he bare the sin of many, and made intercession for the transgressors. Job,David and others more than knew the sorrow of loss,but the difference in them is they chose to continue to trust in the Lord in the midst of the storms of their lives!Job suffered the loss of seven sons and three daughters and it was not over years as we may suffer loss,but at once all his children were gone.It certainly did not help when he was covered from head to toe with boils that his wife who should have been there for to support him said he should curse God and die but Job knew God was his only help in times of trouble (Job 1:20-22), 20 Then Job arose, and rent his mantle, and shaved his head, and fell down upon the ground, and worshipped,21 And said, Naked came I out of my mother’s womb, and naked shall I return thither: the Lord gave, and the Lord hath taken away; blessed be the name of the Lord.22 In all this Job sinned not, nor charged God foolishly. (Job Chapter 2:6-10), 6 And the Lord said unto Satan, Behold, he is in thine hand; but save his life.7 So went Satan forth from the presence of the Lord, and smote Job with sore boils from the sole of his foot unto his crown.8 And he took him a potsherd to scrape himself withal; and he sat down among the ashes.9 Then said his wife unto him, Dost thou still retain thine integrity? curse God, and die.10 But he said unto her, Thou speakest as one of the foolish women speaketh. What? shall we receive good at the hand of God, and shall we not receive evil? In all this did not Job sin with his lips. (Job Chapter 1). Even when the A-mal’-ek-ites invaded the south city of ziklag and burned it down and then took the wives sons and daughters including Davids wives. David was greatly distressed for the people were speaking of stoning him,but he encouraged himself in the Lord! (1 Samuel 30:1-6). And it came to pass, when David and his men were come to Ziklag on the third day, that the Amalekites had invaded the south, and Ziklag, and smitten Ziklag, and burned it with fire;2 And had taken the women captives, that were therein: they slew not any, either great or small, but carried them away, and went on their way.3 So David and his men came to the city, and, behold, it was burned with fire; and their wives, and their sons, and their daughters, were taken captives.4 Then David and the people that were with him lifted up their voice and wept, until they had no more power to weep.5 And David’s two wives were taken captives, Ahinoam the Jezreelitess, and Abigail the wife of Nabal the Carmelite.6 And David was greatly distressed; for the people spake of stoning him, because the soul of all the people was grieved, every man for his sons and for his daughters: but David encouraged himself in the Lord his God. Thank you Sister, I needed this. God Bless you.